We have tried to answer all the common questions, but if you require any further information please use our Contact form and we will endeavour to answer your questions as promptly and completely as we can. Is your mouthguard BPA free? The Somnowell Chrome is BPA free. Bisphenol A (BPA) is used to make certain plastics. The Somnowell Chrome appliances are made from chrome cobalt alloy which is an inert metal like gold. Does it have to be made from this expensive material like gold? The Somnowell Chrome is made from chrome cobalt alloy. This is a well established material in the dental world and is commonly used for making dentures. It has the same qualities as gold that make it ideal for long term use in the mouth. Is the Somnowell Chrome uncomfortable to wear? By design the Somnowell Chrome is increadibly comfortable, follow up studies have found the overwhelming majority of users still wear their Somnowell Chrome every night. In the follow up study reported by Visiting Professor Ash at The World Orthodontic Congress 2010, none of the patients reported discomfort in wear after the normal settling in period. What happens if I lose my Somnowell Chrome? Each Somnowell Chrome appliance is supplied with a rigid storage and travel box that is printed with our company name. We suggest you add your contact details to the sticky label within the travelling case supplied with your device. Should you lose your Somnowell Chrome we recommend you contact us in case it is returned to us. We also suggest that you add the Somnowell Chrome to your list of valuable items for insurance purposes. Is Somnowell Chrome medically approved? The Somnowell range of oral devices are registered with the Medicines and Healthcare Products Regulatory Agency (MHRA) in the UK and the Somnowell Chrome has been approved by the Food and Drug Administration (FDA) in the USA. Do royalty, celebrities and medical people really use the Somnowell Chrome? ENT Consultants, consultants of other specialities, professors, royalty, celebrities, and many doctors have been successfully treated with the Somnowell Chrome, all prefer a non-invasive "non-surgical" approach to treatment wherever possible. Is Somnowell Chrome really the best product of its kind on the market? We strongly believe that the Somnowell Chrome is the leading oral device in the world today, offering the best long term comfortable solution avoiding non reversible painful invasive surgery. The Somnowell Chrome is the choice of ENT Specialists, Chest Medicine Physicians, Oral and Maxillofacial Surgeons, Dentists and other medical professionals. Will the Somnowell Chrome lose its effectiveness over time? Under normal circumstances the Somnowell Chrome will remain effective indefinitely. However in some cases the soft tissues of the mouth and throat will adapt to the forward posture position, and the muscles beneath the jaw and at the top of the throat may change with time. Usually a simple adjustment to the Somnowell Chrome appliance to further posture the jaw is all that is required. Yes the Somnowell Chrome is adjustable after it has been constructed. The lower jaw can be moved further forwards if required. There are two protrusion nuts which enable the amount of protrusion to be changed. This is not often necessary as the Somnowell Practitioner is trained to take a recording of what will hopefully be an ideal amount of protrusion for you. We then construct the appliance based largely on that recording, with some allowance for input from our technicians who will design and correct your Somnowell Chrome appliance. The Somnowell is a mechanical solution to a mechanical problem. Snoring is caused by the airway becoming smaller when we sleep, this can be multi-factorial (weight, muscle tone, anatomy etc). The Somnowell helps to maintain an open airway by holding your lower jaw in what is commonly known as the 'recovery position'. Mandibular advancement devices are one of the most well researched and proven methods for controlling both snoring and sleep apnoea. The main problem however has been with compliance. Other devices are made from bulky plastic and patients cannot tolerate them. The Somnowell Chrome is the first device made from chrome cobalt alloy and is therefore very small and comfortable. It is tailor-made to fit you perfectly and meet your individual needs. It is also extremely durable and hygienic. What is the initial setting of the protrusion? The Somnowell is tailor-made for you. The starting position of the protrusion will therefore already be at what we feel is your ideal protrusion. Every Somnowell Practitioner is trained in finding your optimum position. The Somnowell can also be adjusted at any time with built in protrusion nuts. I have decided to have a consultation with a Somnowell Practitioner. Do you arrange this or do I? Please contact your chosen Somnowell Practitioner directly for an appointment - each of our partners runs his practice independently. If you'd like to speak to a Somnowell representative, please phone the office. If you would prefer however that we arrange the appointment for you just let me know and we will be happy to do this. Is Somnowell Chrome uncomfortable to wear? By design the Somnowell Chrome is designed to maximixe patient comfort, it is increadibly comfortable once the initial breaking in period, follow up studies have found the overwhelming majority of users still wear their Somnowell Chrome every night. In the follow up study reported by Visiting Professor Ash at The World Orthodontic Congress 2010, none of the patients reported discomfort in wear after the normal settling in period. Will you need all my dental records from my regular dentist? The Somnowell practitioner that you see will be able to take the records required to make the Somnowell appliance for you. If other records are required the Somnowell Practitioner will advise accordingly. Can I get this from my ENT Surgeon / Doctor / Sleep Specialist / Chest Physician? The Somnowell is only available from an approved Somnowell dentist. The measurements we require can only be provided by a dentist. A list of Somnowell Practitioners is available on our website. Can I get this from my own dentist? We can work with any dentist as long as they have received appropriate training and are approved by us. We would just need to provide them with the information they need so they can provide us the records that we need to make the Somnowell appliance for you. Why do I have to see a dentist? The Somnowell is an oral device, you wear it in your mouth when you go to sleep. It works by gently holding your jaw forward and in doing so keeps the airway open. This is unequivocally proven to control both snoring and obstructive sleep apnoea. In order to make the Somnowell for you we need very accurate specialist dental records. Dentists are trained to make these assessmenta snd take these records. Why does the practitioner want my medical records? What records a practitioners / clinician requests from a patient may differ from clinician to clinician. This is perfectly normal. The Somnowell Practitioners you recommended do not have the Somnowell mentioned on their website. The Somnowell appliance is a high end medical device and a relatively new area of dentistry. Whilst many practices do add the Somnowell to their website, many others do not. This may be because their website does not get updated very often. It may also be because the Somnowell is a specialist service that they offer. I have an up-to date set of teeth models / upper and lower plaster models, can you use them? It might be possible to use your models. However we would recommend obtaining a new set of impressions from your chosen Somnowell Practitioner. The impressions / models we require are more detailed and complete than those normally required for plastic devices. There is specific information we require from the impressions / models, such as the retromolar areas (the very back teeth), and the labial sulcus (the area inside your lower lip), and a third or more of your palate (roof of mouth). The models must also be cast in a very hard stone (i.e. Crystacal R) to be suitable for the chrome cobalt alloy work. In order to make a Somnowell Chrome appliance we require a forward postured bite that has been taken in line with his guidelines. Plus a facebow record is also required, this is unique to the Somnowell Chrome and is a measuremnt of your upper jaw as it relates to your skull and jaw joints. Can I keep my mouth closed with a Somnowell / breath through my nose? The Somnowell Chrome appliance is designed to not keep the jaws locked together. The reason is that it is not good to keep any joint locked in position. Most patients keep their mouth closed During the night because the Somnowell Chrome is the most slimline device available. As a result patients can typically maintain a natural lip seal and breath through their nose. Most humans are obligate nasal breathers so the Somnowell Chrome is far more tolerable for people to use. Is it easy to put in and take out each night? Once you have got used to the Somnowell Chrome is very easy to put in and take out. The Somnowell Chrome is made to perfectly fit your teeth and mouth and goes into place very easily. Please find below a testimonial from Dr Lindsay Winchester, a Consultant Orthodontist from a major sleep centre. "I have been working in a major sleep studies unit, fitting a variety of mandibular advancement splints, for the last 17 years. The Somnowell appliance is by far the best appliance I have ever used. Some of my long-standing patients who have struggled with other custom-made splints have converted to the Somnowell and have been amazed at how easy it is to wear and how successful it is in curing their snoring and sleep apnoea. The slim-line design and the precision of fit make this appliance the easiest to wear and most tight-fitting,holding the lower jaw forwards and opening up the airway. None of my patients have found this uncomfortable and without exception prefer it to any other splint they have tried. My Somnowell patients frequently tell me I have transformed their lives, as well as that of their partners. This appliance, in my opinion, truly is the "Rolls Royce" of Mandibular Advancement Appliances and I would urge any patients who are suffering from snoring or sleep apnoea to seek a consultation from one of the experienced Somnowell practitioners." Does this harm gums after long use? The Somnowell Chrome is unlikely to cause any harm to the gums or soft tissues in the short or long term providing the device is fitted, regularly maintained and used correctly and is removed daily and is kept clean. The mouth must also be kept clean and dentally fit. Acrylic and thermoplastic devices are theoretically more potentially damaging to the gums as these devices are soft tissue borne and harbour bacteria and oral flora. The Somnowell Chrome is almost entirely hard tissue borne i.e. supported by the teeth. Will the Somnowell Chrome change my bite or jaw relations? This is now a fairly well documented disadvantage of any mandibular advancement appliance (MAA). All MAA's are based on functional orthodontic appliances and these devices can give rise to jaw position and or occlusal changes. These should be brought to your attention at the consultation. All of our supplied consent forms include a warning of this risk. Patients are advised to wear their devices strictly at night and not every night. Patients should be given the morning bite settling devices and shown how to use these. There is no current means of predicting which cases are most at risk. Visiting Professor Simon Ash, the Somnowell inventor, has seen several of these cases over the years and in most cases the patients have opted for accepting a change in their occlusion in preference to living with obstructive sleep apnoea or CPAP. See Contraindications for more information. Prices can be obtained from your nearest Somnowell Practitioner. The Somnowell Chrome is tailor made for you using systems and techniques established by the inventor Visiting Professor Simon Ash who is a Specialist Orthodontist and one of the world's leading experts in this area. The Somnowell Chrome is made from cast chrome cobalt which makes it the smallest and most discreet, and by far the most comfortable device available. It is also the only device that can be sterilised and will always be clean and fresh. The Somnowell Chrome is adjustable and should last indefinitely. Do you have any cheaper devices? Please see our midrange plastic mandibular advancement device, the Somnowell Clear. How long will the Somnowell Chrome last for? The Somnowell Chrome is made from a Chrome Cobalt alloy and is designed to last indefinetly. It is guaranteed against manufacturing defects. However the forces in the mouth can be so enormous during jaw parfunction and bruxism that these may distort and damage the Somnowell Chrome. Damage caused by jaw parafunction and bruxism is not included in the guarantee. If there are any changes to the anatomy of the teeth then the device may not fit, this is not a defect in device manufacture. It is essential that you maintain a healthy mouth and take good care of your Somnowell Chrome device. We have had very few failures, less than 2% including patient's own accidental damage. If it appears to be a failure in manufacturing then we replace without charge within the guarantee period providing this was not the result of bruxism and or jaw parafunction or breakages outside of the mouth. Can you guarantee that it will work? In Visiting Professor Ash’s follow up survey 2015, a 91% success rate was reported 6% did not know if it had worked and only 3 % said that it was unsuccessful for them. The Somnowell Practitioner will however first assess your suitability before agreeing to provide the Somnowell appliance. What guarantee do you have? The Somnowell Chrome devices have a 5 year guarantee against manufacturing defects, the Somnowell Clear has a 1 year guarantee against manufacturing defects. They are not guaranteed against damage caused by Bruxism, parafunction jaw movements or misuse. This is one of the the longest guarantees of any device. If it appears to be a failure in manufacture then we replace without charge. Is the usable lifetime limited by how the teeth and jaw grow? Normal facial growth and tooth eruption is completed by the late teens after which only minor facial changes will occur and these minor changes are unlikely to affect the fit of the Somnowell Chrome device. Most of these devices will last at least 10 – 15 years in normal circumstances. Visiting Professor Ash started using Chrome Cobalt in 1998 to treat patients with Snoring and obstructive sleep apnoea. The Somnowell Chrome was first fitted in 2006. The tooth anatomy does not change once the teeth have erupted except if there is wear, tooth loss, fracture or restorative work. Teeth are constantly moving and in a state of balance according to the forces applied to them within the mouth. Can it replace my CPAP? We successfully treat a large number of people with sleep apnoea that cannot tolerate CPAP. Mandibular advancement devices are recommended for mild to moderate sleep apnoea and can be used in cases of severe sleep apnoea if the CPAP is not tolerated providing this is agreed with the medical physician managing the sleep apnoea. Follow up sleep studies confirm the effectiveness of the Somnowell. The Somnowell can also be used in conjunction with CPAP if desired, as this can help make CPAP more tolerable by enabling a reduction in pressure. We recommend that any changes in the use or settings of the CPAP machine should be undertaken by the prescribing medical physician. What if I have severe sleep apnoea? The Somnowell appliance is being used successfully by people with mild to severe sleep apnoea as confirmed by follow up sleep studies. If you suffer from extreme airway closure then it would be highly recommended to have a follow up sleep study with the Somnowell device in place to confirm its effectiveness. Mandibular advancement devices are recommended for mild to moderate sleep apnoea. They can be used for people with severe sleep apnoea if they can not tolerate CPAP providing this is agreed with the medical physician managing the sleep apnoea, but of course due to the severity of the condition a follow up sleep study to confirm its effectiveness is very important. It is important that you have had an overnight sleep study and have been assessed by a physician. You are able to use the Somnowell in conjunction with other treatments, e.g. CPAP and lifestyle changes. 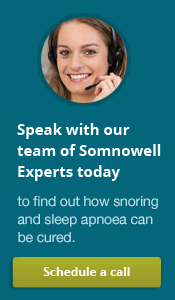 In fact many of our patients with sleep apnoea do find that the Somnowell alone is effective. However, you must be guided by your physician as to whether they should cease to use CPAP or other prescribed care. 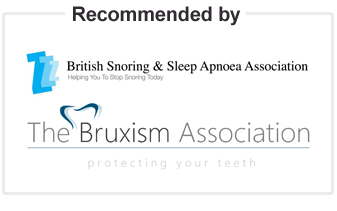 What if I suffer from bruxism too? We need to qualify this. The Somnwell Chrome devices are very resistant to normal jaw wear and tear however the Somnowell Chrome devices will not stop you bruxing, it may discourage the grinding habit. The Bruxism and jaw parafunction may damage and break the Somnowell chrome devics as the forces exerted can be extremely strong. The Somnwell is not guaranteed against damage caused by bruxism and jaw parafunction. The Somnowell Chrome is considerably more resistant to these adverse oral conditions than almost any other mandibular advancement device currently available today. What If I suffer from sleep apnoea and bruxism? The Somnowell Chrome is ideal for sleep apnoea and bruxism combined. This is actually far more common than people realise. The Somnowel Chrome may also help reduce the bruxism and it may protect the teeth from damage caused by the bruxism and jaw parafunction. The Somnowell Chrome may enable you to close your lips during sleep, this is one of teh advantages of the Somnowell Chrome appliance. See guarantee for more information. Aren't I better off just choosing a low cost one size fits all type MAS product? Such devices can cause more harm than good, as confirmed by published scientific research in this field. Poor fitting plastic or acrylic oral appliances can cause damage to the jaw joints. We strongly discourage patients from experimenting with other oral devices, as this can discourage patients from using this treatment method completely. The Somnowell Chrome should be the appliance of first choice and other treatment modalities should only be used in extreme cases. What if I suffer from TMJD / jaw pain and my jaw extends / moves to one side? The Somnowell is unique amongst mandibular advancement devices in that we train our practitioners to take recordings of the forward postured bite are registered in a protrusive symmetrically centred relation to the jaw joints, as well as using a special jaw relation measurement tool, so that we can properly manage situations like this when the jaw moves to one side when extended. Will it give me jaw ache? The Somnowell Chrome is very unlikely to give you jaw ache as it is tailor made for you and your jaw. We take measurements of the way your jaw opens and closes that no other appliances manufacturer does. We also train our practitioners specifically on taking the record of the lower jaw in the forward postured position in such a way as to avoid these jaw ache problems that occur in other devices. Furthermore the appliance is uniquely adjustable on the left and right side independently to further avoid jaw ache. The Somnowell inventor, Visiting Professor Simon Ash, also has a special interest in TMJD (jaw pain), so he has designed an appliance to avoid these problems. I currently use a mandibular advancement device but it gives me jaw pain. Will the Somnowell Chrome also give me jaw pain? Jaw pain is a common problem which may be aggrevated by mandibular advancement devices that do not manage the jaw joints and associated structures properly. The Somnowell Chrome is the only MAD appliance that requires a facebow recording so that we can design and construct the Somnowell Chrome to work in harmony with the individual tooth and jaw relations. The Somnowell Chrome is also used by some people for reducing the symptoms of TMJD (jaw pain) as it holds the jaw in a balanced and therapeutic position. The Somnowell Chrome and production is led by Visiting Professor Simon Ash, the Somnowell Chrome inventor and Specialist Orthodontist. Visiting Professor Ash has a special interest in TMD and has designed the Somnowell Chrome with very careful consideration of the individuals jaw joints so as to reduce the likelyhood of any problems. The Somnowell Chrome is also adjustable so that most jaw pain problems can be addressed. What if I have crowns, bridges, or implants? All restorative work should be complete and sound before the records are taken for the Somnowell. In general we construct the Somnowell over the prosthetic teeth as by its very nature the Somnowell may actually protect the restorations from night time grinding and clenching, however please see Somnowell Clear indications & limitations. Also tooth movements and jaw relation changes. See guarantee for more information. Does it need to be re-made after a crown or filling? If the technician and dentist follow the guidance we provide then it may not be necessary to change the Somnowell as the new prosthesis (crown / filling etc) can often be constructed to fit within the existing Somnowell. However if extensive dental work is undertaken then it is likely that the dental anatomy will alter and the Somnowell will not be a good fit and a remake of part or all of the device may be required. When we make the Somnowell Chome it might be possible to avoid that area and put a bar over the top and not add any clasps to those teeth. The Somnowell Chrome would also help protect those teeth from parafunction such as night time clenching, bruxism and tooth grinding. The Somnowell Practitioner would need to inform us of this design change requirement. Alternatively the Somnowell can be made over the top of the post crowns. If they are removed at a later date and replaced with implants that are a different shape and size, then that individual part of the Somnowell would need to be re-made. See guarantee for more information. I am getting an implant with a crown on top. Should I wait a while before getting a Somnowell? After the crown is placed on the implant we would recommend waiting two to three weeks for the crown to settle before having the impressions made for the Somnowell appliance. What if I have missing teeth / can you add false teeth? The Somnowell Chrome is based on partial denture principles and therefore works very well for people with missing teeth. We can also add false teeth to the appliance if required. The Somnowell Chrome has excellent retention and is designed for the individual. What if I have missing teeth and grind my teeth / have bruxism? The Somnowell Chrome is based on partial denture principles and therefore works very well for people with missing teeth. We can also add false teeth to the appliance if required. The Somnowell Chrome has excellent retention and is designed for the individual. The Somnowell Chrome is ideal if you suffer from snoring and bruxism, this is actually quite common and the two can be linked. The Somnowell Chrome being made of metal, is very resistant to damage from clenching and grinding, the presence of the opposing metal frameworks provides a barrier between the jaws and perhaps some protection to the teeth and in some cases may discourage the bruxing habit. However the forces applied by the jaws are enormous and may cause the device to be distorted or damaged which may adversely affect the fit and success of the device. See Contraindications for more information. What if I have missing teeth / very few teeth / no teeth? We are able to make a Somnowell Chrome for you even though you have missing teeth. In fact we make a lot of Somnowell Chrome appliances for people with missing teeth. The Somnowell Chrome is based on partial denture principles and manages challanges of missing teeth very well. Providing you have sufficient teeth or implants to support a denture then it is likely that a Somnowell Chrome could be constructed for you. It is essential that this is discussed with your Somnowell Partner Dentist. The fraimeworks will normally gain sufficient retention from the remaining teeth. The technical team in comunication with your Somnowell Dentist partner assess each case on its merits and advise you. As a guide only, the mininum number of teeth is 4 in the lower jaw. Ideally two at the front of the dental arch and two at the back on both sides. In the case of implants if a very retentive denture is present then the Somnowell Chroms can usually be made to fit over the implant supported dentures. Additional laboratory work & costs may be necessary to compensate for the absence of the intact natural dentition and if the addition of false teeth are required. If I have the wisdom teeth removed will this affect the Somnowell fit? Providing the Somnowell is not reliant upon the wisdom tooth for its stability and retention its loss should not affect the fit because they are the terminal teeth, the very end ones. If the Somnowell takes in the very back teeth then normally we just put a rest on the wisdom tooth. In the event of your wisdom teeth being removed the teeth would not be there and the rest would be. If necessary we can remove this part at a later date. Is it possible to use the Somnowell appliance if I have no molars, only the premolars? Retention is normally gained from the molar teeth as well as the teeth at the front of the mouth, Retention may be challenging in the absence of molar teeth. the device may need additional posterior support blocks. If the dentist feels that the clinical situation could support a chrome partial denture then the Somnowell should be ok. Does it need to be re-made after tooth implant or removal? If an individual tooth is lost then if the device remains retentive and the patient is happy to accept the void left by the tooth loss, then the device can continue to be used. It is usually possible to add acrylic false teeth to the space on the Somnowell Chrome but this must be judged on a case by case basis since the Somnowell Chrome devices are based on chrome partial denture principles. If the technician and dentist follow the guidance we provide then it may not be necessary to change the Somnowell Chrome as the new prosthesis can often be constructed to fit within the existing Somnowell Chrome. However if more extensive dental work is undertaken then it is likely that the dental anatomy will alter and the Somnowell Chrome will not be a good fit and a remake of part or all of the device will be required. I only have a few teeth. What if I lose any of my remaining teeth would that render it unusable? The Somnowell Chrome is based on partial denture principles and therefore manages the challanges of people with missing teethvery well. The minimum requirement is 4 teeth or implants in the lower jaw. However each case will be judged on its merits. The Somnowell technical team will assess the records and information supplied by the Somnowell Partner Dentist who would then agree the best options available for you. Normally if you lose a tooth then this should not be a problem as the Somnowell will be able to gain enough retention from the remaining teeth. This does however depend on the number of teeth you have beforehand and how many teeth you lose. What if I have dentures? The Somnowell Chrome is based on partial denture principles and can have false teeth added to it if you wish. The upper part can be made as a full denture, however this will require additional laboratory work and add to the costs of the device. It may be able to construct a Somnowell Chrome device to fit over your existing dentures if your dentures are very retentive and stable. The upper jaw is not usually a problem providing there is sufficient bony alveolar ridge support. However a Somnowell is unlikely to be retentive in a fully edentulous lower jaw i.e. in the absence of any tooth or implant support. A device if constructed would be unstable and non retentive. Many patient have overcome this by having implants and dentures supported by the implants and then to have a Somnowell Chrome that is worn over the implant retained dentures. The Somnowell Chrome is based on partial denture principles and works very well for people who have missing teeth. The Somnowell Chrome can be made with the addition of false teeth but this will require additional laboratory work and increase costs. If I have no teeth but want to get implants. What would be the criteria in terms of teeth needed for the Somnowell? What is the basic minimum number teeth the Somnowell needs? Where would be the best position(s) for these teeth be? Deciding where to place implants and the number and location of teeth is a clinical decision for each patient to be taken by the clinician. As a guide , if there are sufficient teeth to support a partial denture then in most cases this will be sufficient to support a Somnowell Chrome. If a patient is edentulous ( has no teeth) in the upper arch and has a good alveolar ridge, then it it is often possible to construct an upper full denture carrying posterior attachments for the piston rod assembly however this will require additional laboratory and clinical stages with additional costs. Since the force vector applied to the upper jaw is posterior and superior to the occlusal plane. In the lower jaw retention and transverse balance is often more challenging. The principles of prosthetic denture construction and design apply. If a patient requires restorative, prosthetic, implant work then all of this should be completed before records for a Somnowell are taken. For patients with dentures supported by implants then providing the dentures are well retained with the implant and associated superstructure apparatus then the Somnowell impressions are taken over the dentures in situ and the Somnowell Chrome is constructed to fit the dentures such that the denture is sandwiched between the implants and the Somnowell Chrome. It may be necessary to prepare some undercuts in the dentures for retention of the Somnowell Chrome (the patient must in advance be consulted about this). Chrome Cobalt is an inert metal and therefore does not react with the metallic fillings in the mouth. The chrome does not cause a galvanic reaction when in contact with metals in the mouth. Is there any element of cobalt in the chrome that is radioactive to any extent? Chrome Cobalt is an inert metal which has been used in dentistry for in excess of 80 years world wide. It does not react with amalgam restorations in the mouth. There is no reported electrolytic reaction with the Chrome Cobalt that we have come across. The material is not radioactive. Is the Somnowell nickel free? The Somnowell Chrome frameworks are made of a nickel and molybinum free alloy. I am overweight / I am obese, will it still work for me? The Somnowell works for people that are overweight or obese. It gently holds the lower jaw forward and keeps the airway open, thereby effectively controlling snoring and sleep apnoea. If you are overweight then weight loss is always advised, however other reasons for snoring can include changes in muscle tone as we age, and your individual anatomy such as the shape and size of your lower jaw. I have sinusitis, would the Somnowell help me? Sinusitis is not a contraindication for the Somnowell appliance. The Somnowell works by keeping the airway open and thereby effectively controls snoring and sleep apnoea. The Somnowell treats the snoring that comes from deep in the throat. This is the most common type of snoring. If you have Sinusitis then we would also recommend that you seek the advice of an ENT specialist. Would being pregnant be a problem? Being pregnant will not affect the use of the Somnowell appliance. What if I also suffer from lip / cheek / tongue biting? If there is a tongue biting and lip biting habit, this habit may and almost certainly will persist and the you may continue to catch the soft tissues between the teeth and any device placed in the mouth. However, the Somnowell should help control the sleep related breathing problems. What if I have an overbite / receding jaw / small lower jaw? Mandibular advancement devices are derived from and based upon functional orthodontic devices commonly used by orthodontists to advance the lower teeth and jaw in growing children and young adults. An overbite or receding jaw will not necessarily affect the efficiency of the Somnowell Chrome because it is entirely tailor-made for you. This is one of the main advantages of the Somnowell appliance. It is entirely custom made as opposed to customised devices or one-size-fits-all devices that are designed for 'average' shapes and sizes of mouth. Furthermore our technicians will take your overbite into consideration when they design the Somnowell Chrome appliance for you. What if I have a cross bit/ Scissor bit / side bite? A crossbite can very likely be accommodated by the Somnowell Chrome appliance due to the fact that it is tailor-made for your unique jaws and teeth. Most other devices are a one-size-fits-all or only partly customized and rely on the patient having 'normal' jaw shape and size. The Somnowell Chrome is also far better at accommodating people with a crossbite as it allows for a large degree of lateral (side-to-side) movement. The technical team at Somnowell will design the Somnowell Chrome device and may communicate with your Somnowell Partner Dentist as required. To accommodate for transverse jaw discrepancies, the Somnowell Chrome may need to be widened. With epilepsy there is a risk of the appliance becoming dislodged in the mouth if you have an epileptic fit, as with any removable appliance worn in a patients mouth. The appliance could also be damaged by the patient during an epileptic fit. We have to be very careful with treating epileptic patients, and the patient must be fully aware of the the risks. If the epilepsy is controlled than subject to the approval of your medical doctor who manages your epilepsy, then a Somnowel Chrome may be a possibility. The Somnowell should only be fitted to patients whose mouths are dentally fit. You are advised to see your dentist in order to have the gingivitis resolved before embarking on your Somnowell treatment. Any oral device may harbour bacteria and potentially aggravate gingivitis. The Somnowell Chrome is probably the smallest and most slimline mandibular advancement device available. It keeps well clear of the areas of the mouth that trigger the gagging reflex. Unfortunately some patients are unable to tolerate the record taking stages of the device manufacture and the wearing of these devices in spite of the discrete nature of the Somnowell mandibular advancement device. The help of a hypnotherapist may resolve the gag reflex / claustrophobia habits. Will the somnowell device work if the snorer has a soft palate? Everyone, except those with a cleft palate or post surgery, has a soft palate. The deep snoring at night when we are unconscious cannot be replicated when we are awake. We can make the soft palate vibrate and make a nasal snore. Its important that the patient breathes through the nose. If there is a very large uvula (end of soft palate) there may be a case for an ENT assessment. The Somnowell usually works in these patients. Can I use the Somnowell if I have an overbite (lower jaw set back) / receding lower jaw? In cases where this is a deep overbite, top teeth covering the bottom teeth and or a retrusive retrognathic mandible (receding lower jaw), the Somnowell Chrome is suitable. I have a large / floppy uvula. Does your device work in cases such as mine? The presence of a large or floppy uvula is not a contraindication to the wearing of a mandibular advancement appliance such as the Somnowell Chrome. These devices posture the lower jaw forward and open the posterior pharyngeal airway. Thereby controlling snoring and obstructive sleep apnoea. We successfully treat many patients with large or floppy uvulas. In fact there are a number of ENT surgeons who use the Somnowell themselves. If you have concers relating to your soft palate then the advice of an ENT or Oral and Maxillofacial specilist should be sought. Can I use the Somnowell if I have an underbite? In cases where this is an anterior open bite, a gap between the upper and lower front teeth, the addition of any oral appliance and the advancement of the lower jaw may well aggravate the anterior open bite and challenge the degree of lip competence. What if I have braces? If you are undergoing active orthodontic treatment and the teeth are still being moved by your braces, it is best to have your Somnowell MAD made once the active orthodontic treatment is finished. It is possible to have a Somnowell Chrome which not only holds your jaw forward for snoring but also carries tooth retention bars to help keep the teeth straight after brace work. The Somnowell inventor, Visiting Professor Simon Ash, is a Specialist Orthodontist. I am thinking about getting braces / veneers so should I get the Somnowell afterwards? Any planned Orthodontic and or restorative work should be completed beforehand. The Somnowell Chrome was designed by Visiting Professor Simon Ash a Consultant and specialist Orthodontist, he has taken special care to design and appliance that can help to keep the teeth in place. The Somnowell Chrome if additional retention features are requested acts as an excellent retainer after orthodontics or extensive restorative dental treatment. Visiting Professor Ash designed the Somnowell Chrome in this way because one of the common problems with plastic mandibular advancement devices is unwanted tooth movements. Will it stop my teeth moving / work like a retainer / cause unwanted tooth movements? The Somnowell is particularly suitable if you have a need to control snoring and also for orthodontic retention. The Somnowell Chrome was designed by Visiting Professor Simon Ash a Consultant and specialist Orthodontist, the Somnowell has been designed to help avoid unwanted tooth movements and to be very effecive at keeping the teeth in position, however as with all mandibular advancement devices, these are based on functional orthodontic devices which alter tooth and jaw relations. There is the risk that patients wearing the Somnowell Chrome may experience these unwanted dental and jaw relation changes. In some cases orthodontic relapse will occur. If you have recently completed orthodontic treatment the Somnowell Chrome can be made with extra retention features, but these need to be requested prior to device manufacture. Will the Somnowell Chrome move my upper front teeth / hurt my upper front teeth? The Somnowell chrome is highly unlikely to move your upper front teeth. The upper front teeth are typically not touched by the Somnowell Chrome. If the balance of forces of the mouth applied to the teeth are altered by any oral device then there is a risk that the teeth may move. This is however a common problem with plastic devices as they pull and push on the front teeth which often leads to pain and unwanted tooth movements. Visiting Professor Simon Ash, the Somnowell inventor, is a Specialist Orthodontist and has specifically designed the Somnowell so as to overcome this problem of unwanted tooth movements that can occur with plastic devices. Does the Somnowell put any stress on the teeth? Acrylic and plastic oral devices gain their retention by the material engaging undercuts on the teeth and by covering the soft tissues of the gums, palate and labial / lingual sulci. Saliva builds up under these devices to help form a seal around the device and this plus the reliance on the undercuts provides the retention. Unfortunately there are adverse effects of this namely that the materials, be they acrylic, thermoplastic or stainless steel clasps, spring into the undercuts and with time these components will deteriorate / work harden and ultimately fail. Covering the teeth and gums in this way prevents the natural flow of saliva and cleansing of the mouth that would normally occur. These devices in addition not only harbour oral flora and bacterial plaque but also hold the plaque against the teeth and soft tissues whilst the appliance is in situ. In some cases this gives rise to a monilial fungal infection (thrush) often seen in babies mouths or beneath dentures. The Somnowell Chrome being made of a cast metal depends and gains support from the teeth spreading the load over the teeth. Retention is mainly gained by virtue of the paths of insertion being different to the moment of forces derived by the function of the device. Thus as the forces applied to the Somnowell Chrome cause the device to become more retentiv. The occlusal balancing of the Somnowell Chrome is designed to spread a the opposing loading forces across the dental arches. Teeth are designed to resist occlusal forces and the Somnowell Chrome takes advantage of this. The gums & mucosa are designed to support the teeth but should not in general be covered and not used for direct appliance support. Can I keep my driving licence if I have sleep apnoea and use the Somnowell? It is your responsibility as a driver not to drive knowing that you have untreated sleep apnoea which places you and other road users at risk. It is your responsibility to cease driving and report to the driving licence authority (DVLA in the UK) if you have untreated sleep apnoea. You should contact your doctor immediately. If in a sleep physician’s opinion you are safe to drive then the wearing of a Somnowell may assist in the management of your condition. How do I prove I use the device / compliance, for my driving licence and insurance? It would be the responsibility of a medical physician to confirm that the patient is conforming with treatment and is insurable. We treat a lot of people with OSA that rely on their licence for their job, such as pilots, train drivers etc. Your Somnowell Dentist is not trained or allowed to verify your fitness to drive, you must return to your doctor or sleep physician for advice. High device fracture rate when subject to jaw parafunction and Bruxism' at the bottom as a new point. Appliances cannot be sterilised, cannot be put in very hot water, often become smelly, unsightly and difficult to clean. A very hit and miss distribution of loading over the teeth especially where there is wear or deterioration of the materials used. See guarantee for more information. I Have a plastic device that I have to regularly replace? The Somnowell Chrome is made from cast chrome cobalt alloy and therefore does not need to be regularly replaced like alternative plastic devices. Under normal oral conditions and use, it does not deform or degrade. The Somnowell Chrome is tailor made to fit the mouth and with normal use ( excluding bruxists and patients with jaw parafunction) is unlikely to become loose. However a progressivly loose device may be secondary to mouth breathing so that the jaw and lips are falling apart during sleep. If mouth breathing is occuring, then the Somnowell Chrome may become loose and may not give optimal results. Such devices can cause more harm than good, as confirmed by published scientific research in this field. Poor fitting plastic or acrylic oral appliances can cause damage to the teeth, allow unwanted tooth movements and may disturb the jaw relations and TM joints. We strongly discourage patients from experimenting with other oral devices, as this can discourage patients from using this treatment method completely. The Somnowell Chrome should be the appliance of first choice and other treatment modalities should only be used in extreme cases. Is the Somnowell Chrome better for my oral health than plastic devices? It is well recognised that plastic and thermoplastic are only intended as temporary materials for use in the mouth. Wherever possible oral devices should be made of metal and be supported by the teeth rather than the gums and soft tissues. Metal devices are easy to maintain and to keep clean. They do not have a porous surface and are less likely to harbour oral bacteria and oral flora. It is Visiting Professor Ash's opinion that the Somnowell Chrome is better for your oral health than plastic devices because the Somnowell Chrome allows the natural flow of saliva around the gums and teeth. Furthermore the Somnowell Chrome does not hold plaque against the teethto neasrly the same extent like plastic devices do. The Somnowell Chrome is entirely custom made for your individual mouth, as patient comfort is a prime objective of the Somnowell Chrome . Each part of the Somnowell Chrome is designed to perfectly fit your teeth, jaws, and palate. Plastic devices are often made in standard sizes which can make them ill-fitting, less effective and uncomfortable. One of the major advantages of the Somnowell Chrome is that it makes minimal infringement into tongue space, unlike many non metallic devices. This makes it more comfortable, well tolerated and highly effective. As the Somnowell Chrome does not pull or push on the tongue it will not leave the tongue feeling sore. Wherever possible, the lower bar connecting the two lower sides of the jaw is placed on the outside of the teeth leaving the inner surface of the lower front teeth for the tongue to rest against naturally, enhancing patient comfort. I have been to see a specialist. I have a very large uvula and he is suggesting surgery. Does your device work in cases such as mine? The presence of a large uvula is not a contraindication to the wearing of a mandibular advancement appliance and the Somnowell. These devices posture the lower jaw forward and open the posterior pharyngeal airway. A reduction in the bulk of any soft tissues within the posterior airway may be beneficial to you. Soft tissue obstructions may lead to airway restriction and encourage mouth breathing. This will in turn aggravate snoring and obstructive sleep apnoea. What is your opinion of surgery for snoring / sleep apnoea? We treat a large number of patients for whom surgery has not been successful. The snoring we treat comes from deep in the throat, this is what the vast majority of snorers suffer from. A reduction in the bulk of any soft tissues within the posterior airway may be beneficial to you. Soft tissue obstructions may lead to airway restriction and encourage mouth breathing. This will in turn aggravate snoring and obstructive sleep apnoea. Orthognathic surgery (surgery to the jaw bones) has been proven to be an effective method of treating snoring and obstructive sleep apnoea. Unfortunately this type of surgery is complex and carries a morbidity / mortality risk. A deviated septum does not mean the Somnowell will not work for you. We treat a large number of patients for whom surgery has not been successful. The snoring we treat comes from deep in the throat, this is what the vast majority of snorers suffer from. Any blockage of the nasal airway will encourage mouth breathing and snoring. Correction of the deviated septum and or removal of nasal airway obstructions is usually beneficial. All the content within the Somnowell website is provided for general information only, and should not be treated as a subsitute for the medical advice of your own doctor or any other health care professional. Somnowell is not responsible or liable for any diagnosis made by a user based on the content of the Somnowell website. Somnowell is not liable for the contents of any external internet sites listed, nor does it endorse any commercial product or service mentioned or advised on any of the sites. Always consult your doctor if you are in any way concerned about your health.